New option adding stars on designing the leaderboard map levels. 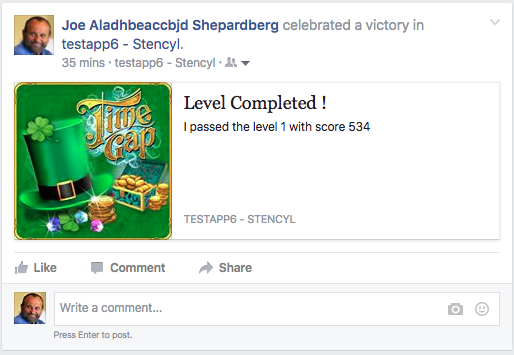 Each level can display from 1 to 3 facebook highest score users. This update is the most extensive update on the game-kit ever made. Optimization has been made in all the code for speed and stability. Every playable situation of the Facebook user has been taken in consideration online and offline, multiple players using the same device and also one player using different devices. Every score post has it's timestamp and also options of the game to preserve the highest score done for each level, the same also with the bonus. This is the most complex complete score mechanism for Facebook ever made that resides inside an application. Although, this is a plug and play. You just only need to tell each time what level, score and bonus the user played. The rest will handle our game-kit. Said that, this update Version 5e of our OjyaLeaderboard Game-Kit has an 'error free' score mechanism. As the game-kit is made by behaviors every future update from now on will be made and installed easily just by importing only the updated behavior. Ready to use it , in all your games , by changing of course the graphics this is a great game-kit for your development. Please, visit our site for how to use the Game-Kit or just only the Facebook Extension and it's blocks. A great update was made today for the Ojya Leaderboard, to version 6. Full support for Facebook API 2.8. Plug and play by setting only 3 attributes in the game-kit. Note that Ojya Leaderboard has also an advanced off-line score mechanism. Understands every possible situation so you will continue to play and post scores even if not connected in internet. Graph API 2.8. As you may know Facebook after years removed the custom open graph actions and objects. In that way left developers to only use the standard objects. OjyaLeaderboard with version 6 is prepared right now for the next step of OpenGraph. Inside the zip file you get, there are instructions in detail of how OjyaLeaderboard works in every step. Thank you ! And happy new year. I'll definitely be getting this soon! Full Unicode support for foreign languages, displaying the users' name. Bypasses the font mechanism of Stencyl and brings full support of Unicode with external ttf fonts. Much better draw text mechanism than Stencyl's. European languages, Arabic, Chinese, Russian and many others with just one font ttf. Plus, a lot of improvements on the code. - New Facebook call mechanism, extension blocks with wrappers. Cleaner block interface inside Stencyl ! - Master your Facebook callbacks with easy. Preference extension block for the wrapper behaviour. Advanced error-free control of the Facebook callbacks. - Celebrate OpenGraph Story post block. 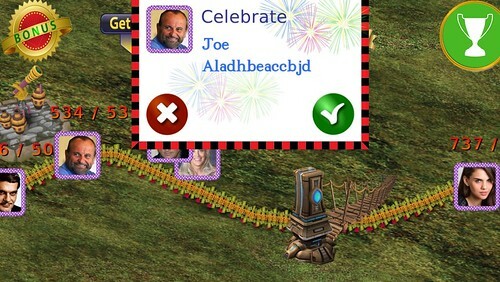 Example of use in our game: Pressing your image profile you post the celebrate story. Pressing on friends image profile you post the challenge. 14 Facebook extension wrapper blocks with one common Callback Settings block. Ojya Leaderboard version 7a is released ! in only 20 min ! 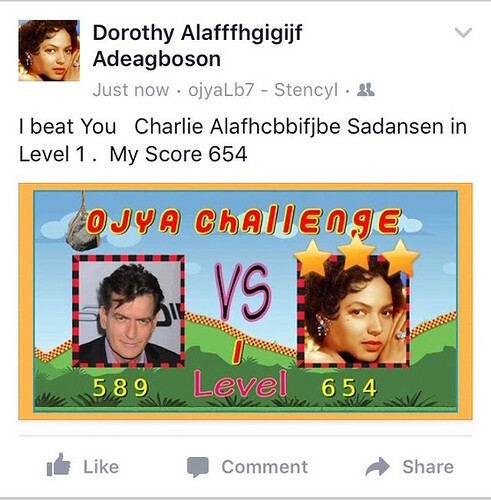 Ojya Leaderboard is a must asset for all game developers who want to use Facebook leaderboards and promote better their game. Graphics is another thing that can be changed in only 20 minutes, creating two completely different leaderderboard maps, one for the single level and one for all levels design. The designing of those 2 maps is based on 2 lists with x,y coordinates. With this video tutorial you will be guided of how to change those two complex maps in only 20 minutes and provide new path with x,y coordinates for the designing , with your personal graphics. This makes OjyaLeaderboard a great asset, for all your games as every leaderboard can be totally different , from medieval design to hi-tech. How to make key hashes? there is the OjyaLB block KeyHash block. Actually go to scene behavior 'LoginStart' , in the custom block 'LoginToFacebook' , at the top there is the block'KeyHash' disabled. Enable it, and go to Stencyl Menu 'Debug/Android/Launch Device Monitor'. Monitor the responses - traces of your Device running the game and look for 'PXR: ... '.